I still have in mind the words pronouced by a friend of mine a few days before my first trip in Budapest, back in 2010. He had been there several times already. “Budapest, it’s the world capital of X-rated movies. And when you take a walk in the evening there, especially during weekends, you understand why!” When you hear those kind of things, that makes you really want to go there, just to know what looks like a city where “you understand why it’s the world capital of X-rated movies“. Budapest is a city that I really appreciate. Going there three times already before this trip is proof of my love for Budapest. I feel like Budapest is the best of both worlds, a mix between Western Europe and Eastern Europe. There’s a little bit of both, the general atmosphere, people’s mentality, the culture. That’s not surprising, Budapest is basically is in the middle of Europe. And most importantly, Budapest is a very lively city, with lots of bars, people outside at any time, day and night. Big contrast with Bratislava, where I was a few days before. Still, Budapest changed a lot since my first trip there in 2010. At the time, there were several abandoned neighborhoods with partially destroyed buildings, falling into ruins. We don’t see them anymore now, and walking in the streets, I saw several hotels under construction. Everything is still cheap (compared to our standards), but I clearly noticed the rise in prices in general, and it won’t stop now! Investors, it’s time to buy in Budapest! Actually, the city is a lot more hipster than it used to. Yeah, I was in the 7th district of Budapest (a trendy area), but still! I saw the difference in the city in general. The (positive) consequence of all this, is that a lot more people speak English now than before. In fact, you don’t even have to ask “Do you speak English?” anymore. Apart from the elderly, almost everybody speaks English. Another consequence, there is wifi everywhere, literally! In all the bars, restaurants… There’s wifi for customers, and it wasn’t the case before. What’s the cause of all this? I’m not quite sure, but one thing had a big part in all those changes, it’s the skyrocketing number of tourists visiting the city the last few years. There are foreign exchange counters everywhere (by the way, change a minimum of money at the airport/the train station, and the rest in the city to not be ripped off, because the rates in the city are a lot more inexpensive). Back in 2010, almost no one around me had ever been to Budapest. Right now, I know a lot of people who spent a least one weekend there. As I said earlier, it’s comprehensible. The city is brimming with nice areas, and places to visit. The pool at széchenyi thermal bath. 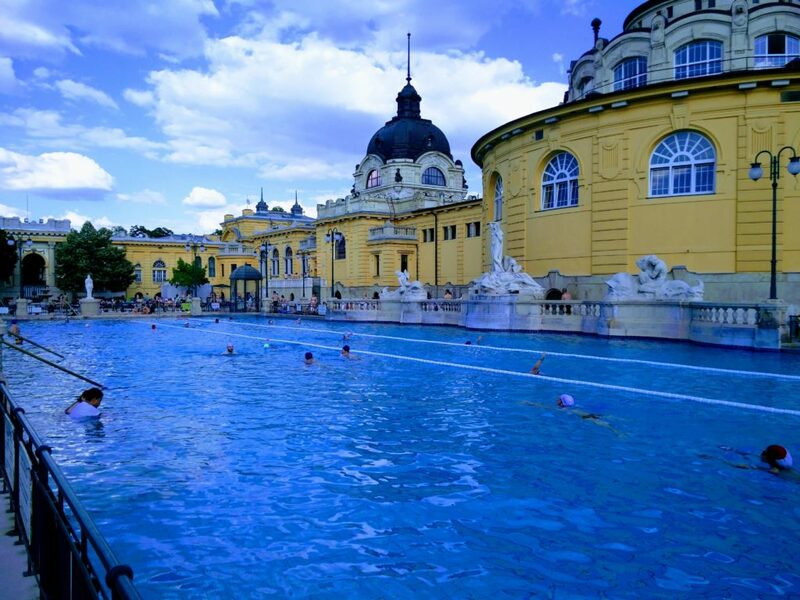 Test out a thermal bath in Budapest! Budapest is divided in two parts, separated by the river Danube. On the west side of the river, we have “Buda”, and on the east side, we have “Pest”. Now you know why the city is called Budapest! On the “Pest” side, we have an unmissable, one of the most popular monuments of Budapest, the Hungarian parliament building. The parliament, in the gothic revival style, is an iconic place of the city. It looks old, but it’s “only” around a hundred years old (construction was over in 1904 exactly). It’s possible to visit inside the parliament, but I didn’t. The best way to take a photo of the parliament, is from the other part of the city “Buda”, especially around Fisherman’s Bastion, where you’ll be in the heights of the city. Next to the hungarian parliament building, you’ll find the shoes on the Danube Bank. What is this? Why do we see about sixty pairs of metal shoes by the Danube? Actually it’s a memorial. Those shoes represent the Jews who were murdered during World Ward II. They were asked to remove their shoes, they were chained to one another by the ankle, then the arrow cross party (fascist political party) only shot two of them, the ones at the end of the line. Those two were falling in the water, dragging down with them all the other ones (they were all chained to one another). A tall basilica is in the area, St. Stephen’s basilica. It’s not surprising to think it’s a tall one, it’s written in the hungarian law, no building can be taller than the hungarian parliament building or this basilica. The basilica is named in honour of the first king of Hungary, Stephen. Inside the basilica, it’s possible to see the mummified hand of this first king, Stephen (of course, you’ll have to pay for that…). At the time, Stephen was moved to a new place after his death, but they took the hand off his body, and it’s -supposedly- still here today. A little bit further on the “Pest” side, we have Heroes’ Square. This monument commemorates the 1000th anniversary of the arrival of Hungarians in the Carpathian Basin. Therefore this monument was built in 1896. Behind Heroes’ Square, you’ll see a park, Varosliget park, the biggest park in the city, and in this park, there is Vajdahunyad castle. This castle opened in 1908. Various architectural styles have been used, those who had an impact in Hungarian history (baroque, gothic…). Next to Vajdahunyad castle, there’s a must-see of Budapest, Szechznyi baths. But I won’t tell you more because I wrote a whole article about those thermal baths. Right here for the article about Szechenyi baths in Budapest. Several bridges link “Buda” and “Pest”, the most famous is Széchenyi Lanchid or chain bridge, suspended thanks to chains. Istvan Széchenyi had the idea. Before that, people had to sail in a small boat. One day, he left Buda to go to Pest, and his father, in Buda, seriously fell sick. Danube river was frozen, he couldn’t go back to Buda. When he was finally able to sail back to Buda, it was too late, his father was dead already. On the “Buda” side, there are less things to see (it’s smaller). Buda castle is there. The castle is located in the heights of the city, and from Buda castle we can see the hungarian parliament building and the “Pest” side of the city. This is where the Hungarian kings used to live. It’s possible to go to the castle via funicular railway from the chain bridge, because otherwise, you’ll literally have to hike up to the castle! There are two museums in the castle, the Hungarian national gallery, and the Budapest History Museum. Next to Buda castle, we have fisherman’s bastion. The perfect place to take pictures of the city, and to take pictures of the Hungarian parliament building. Fisherman’s bastion is here since 1902, and it was built to thank in honour of the fishermen, who protected this part of the city in the middle ages. In the same area, there is the Matthias church, with a multicolor roof. One of the few churches I’ve seen up to now where you have to pay to get in. It’s because inside of it, there’s a small museum. I didn’t go in it, and apparently it’s not essential to go inside this church. There’s still a lot of things to see and to do in Budapest, but in this article, you have an overview. I’m thinking about going to a romkocsma, or “ruin bar”. Those are former abandoned buildings in the city center, converted into regular bars. The most famous is Szimpla Kert, nice, cheap, and good atmosphere! The great market hall, check it out! They sell everything you might be looking for : fruits, vegetables, souvenirs, local food… There’s a wide selection! And you can’t go to Budapest, and not test out thermal baths! Budapest : alone, with your friends, your special one, even with your family, it’s a must see! Are you going to Budapest? Do not leave home without a travel insurance! Hostel or luxury hotel, there’s accommodation for every taste. Looking for a cheap hostel? Check Hostelworld! Otherwise you have a large inventory on Booking. You can also compare the hotel rates on HotelsCombined. Plane, bus, train… There are many ways to arrive in Budapest. There are many things to do in Budapest, some activities might interest you. If needed, get a city guide . I adored that city. I can’t believe a year ago I had zero interest in visiting. I felt right st home. Yeah honestly, Budapest is one of my favorite capital cities in Eastern Europe! Nice photos. This place looks great! Thank you!!! Yes it is! Go there if you can one day!